A new app allows users to chat, "like" and vote on documents, photos or videos in cloud storage accounts. 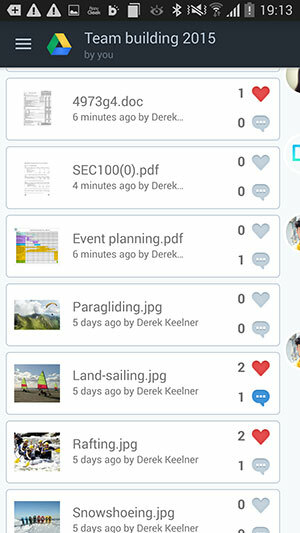 Available for PC, Mac, smartphone and tablet (iOS and Android), FileChat provides a tailored chat room based in any chosen folder or file within a user's Dropbox or Google Drive (support for additional cloud platforms, including OneDrive, Box and Amazon Cloud Drive, will be added soon). Owners of a FileChat discussion can invite new guests to view and collaborate on the files and remove guests as needed, and give the new participants the ability to add files and content, vote and chat. The app also has a search tool dedicated to the discussions around cloud documents, so users can quickly find what they are looking for. Other features include real-time notifications for every FileChat event/update, and the ability to preview and edit files with the user's preferred apps. FileChat is currently free, with premium services/levels launching in the coming months. For more information, visit the FileChat site.